Beneath the waves a secret lies. In the clear blue waters of the Solomon Islands the ruins of an ancient city have lain undisturbed for hundreds of years - until now. Guarded by an ancient curse. Legend - even recent history - tells of a terrible fate befalling anyone foolish enough to venture near. Visitors do not return alive. But when treasure-hunting team Remi and Sam Fargo dive to investigate the city, they find more than ancient monuments and lost artifacts. Because someone is using the legends to hide their own dark and grisly secret. And the closer Remi and Sam get to discovering the truth, the closer they come to being the curse's next victims . 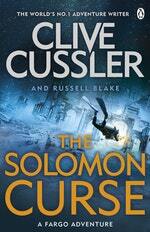 . .
Love The Solomon Curse: A Fargo Adventure? Subscribe to Read More to find out about similar books.